Joshua, seen here, enjoying his reign as the champion of the World. 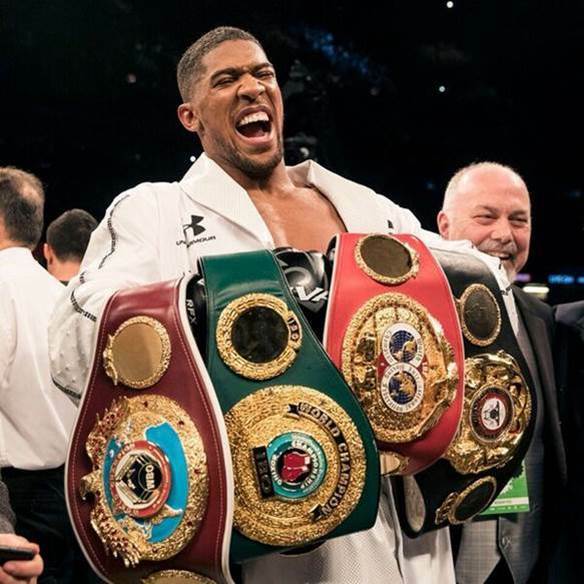 Unified heavyweight champion Anthony Joshua 21-0 (20) has inked a two-fight deal with Wembley Stadium that will see his next pair of bouts take place at the 82,000 seat London arena, it was announced by Matchroom Boxing this week. The first fight will take place in September while the second will be in April next year. “I’m extremely honoured to get the opportunity to promote two more shows at the national stadium and delighted for British fight fans that Anthony has made this commitment to them,” Joshua’s promoter Eddie Hearn said. Joshua, 28, last fought at Wembley Stadium in April last year when he scored his breakthrough win against former long-time world champion Wladimir Klitschko by TKO11. “I don’t think anyone will either forget that night of April 29 against Klitschko and we plan to bring two more dramatic events to Wembley Stadium in September and April. Images from these AJ events make our country the envy of the boxing world and long may it continue,” continued Hearn. The WBA, WBO and IBF heavyweight champion has had his last two bouts at Principality Stadium in Cardiff, Wales against Carlos Takam last October and Joseph Parker in March. Both fights drew live gates of around 80,000 people. “I am returning to Wembley after two mega fights in Cardiff,” said Joshua. “I want to thank the supporters from Wales and Great Britain and also the people of London for patiently awaiting my return. The deal is a coup for Wembley Stadium, who are banking on Joshua to continue delivering capacity crowds to the national football stadium for his next two fights – the second of which could be a unification bout with outspoken American WBC champion Deontay Wilder 40-0 (39). James Taylor, Senior Commercial Manager, Wembley Stadium said: “Wembley Stadium is home to the biggest and best sporting events and it is fitting that one of the world’s leading sports stars returns to fight under its iconic arch. The mayor of London Sadiq Khan was equally ebullient, saying: “That incredible night last year when Anthony Joshua defeated Wladimir Klitschko at Wembley in front of a record crowd will go down as one of our city’s greatest sporting events. Joshua is widely expected to defend his titles against Russian veteran Alexander Povetkin 34-1 (24) in September.